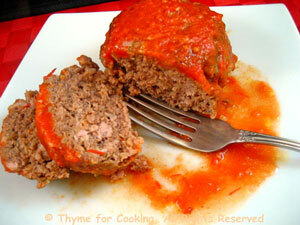 Easy Dinner from Thyme for Cooking: Mini Meat Loaves. Making mini meat loaves cuts the baking time in half and gives you another dinner that can be eaten later in the week or be frozen, either before or after baking. Depending on appetites, you may have enough left for a meat loaf sandwich or 2, as well. Dried onion flakes are new to the pantry for winter. These will, obviously, cook much faster in the microwave and I have seen in the U.S. that you can buy them micro-wave ready ....whatever that means. 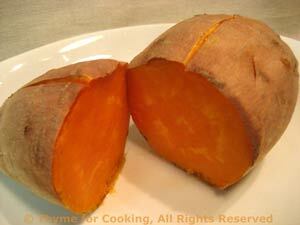 Sweet potatoes are incredibly good for us, easy and delicious! You can start in the micro for 8 minutes, then finish in the oven for 20 - 30 longer. Faster but still with a crisp skin. With a sharp knife cut a shallow slit down the length of each potato. Place on foil in the oven with slit side up. The foil is necessary unless you want to clean your oven - as the potatoes get close to being done the sugars start to ooze out - the slit stops them from bursting. Bake at 400F (200C) for 60 minutes or until done - tender when pierced with a knife. Serve with lots of butter, salt and pepper - eating the skins or not, as you choose. In England they serve plain baked tomatoes for breakfast. We like them, stuffed, as a first course. They also make a lovely, vegetable side dish, especially now, as we move into fall. 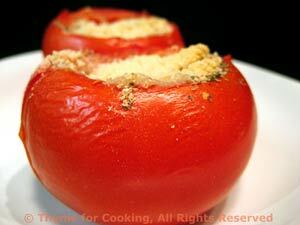 Slice the tops off of the tomatoes and scoop out the pulp and seeds leaving a hollow shell. In a small bowl mix herbs, cheese and bread crumbs. 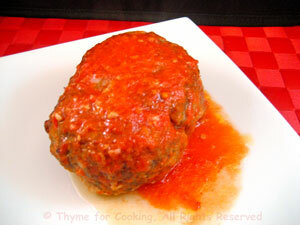 Put into a small, shallow baking pan and bake at 400F for 15 - 20 minutes, until tomatoes are hot and juicy.